Tickle your taste buds with this delicious and nutritious tropical kiwi pineapple smoothie! Ever make a smoothie that no matter how hard you try you can’t set it down? This is one of those mouthwatering smoothies. I had just enough time to take a few pictures before it was history. I try and eat locally grown food whenever possible. However, I make exceptions for tasty and nourishing foods such as kiwi and pineapple. Kiwis are high in vitamin C, containing more of this essential vitamin than an equivalent amount of orange. Vitamin C and the other phytonutrients found in kiwis result in an antioxidant powerhouse. They are also a good source of dietary fiber, potassium, and contain trace amounts of other vitamins and minerals. Pineapples are rich in vitamin C and manganese, and a good source of dietary fiber, folate, copper, vitamin B1, and vitamin B6. This nutrient profile promotes the following health benefits: immune support, antioxidant activity, anti-inflammatory, digestive aid, and protection against macular degeneration. Kiwi and pineapple combined with coconut milk, avocado, lime juice, and honey make for one healthy smoothie. All the credit for this flavorful recipe goes to Amber. She’s a fellow smoothie enthusiast who’s keeping me on my toes. Thanks, Amber! I made this smoothie precisely as the recipe calls for and it was delicious. Enjoy! 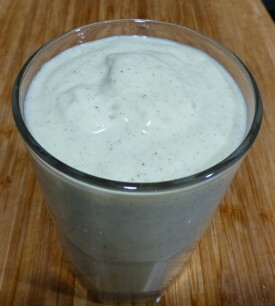 I would love to know if you try this kiwi pineapple smoothie – please leave a comment below. Happy Blending! You’re welcome, Amber! Thanks again for the delectable recipe. Thank you so much for your delicious smoothies recipes. I just love them. Delicious!!!! BUT I didn’t have any pineapple, so I put in the “add ons” plus half a frozen banana and a tablespoon of hemp seeds. This is a keeper. Will try it with the pineapple next time. Thanks!!!! I want to try this today.. but I wanted to ask if I could add a teaspoon of Maca Powder in this? I tried this, but used semi-skimmed milk instead of coconut milk and found it turned out to be a little too frothy. Is it because of the type of milk I used or did I blend it too long? The frothiness is likely due to the semi-skimmed milk. You might also try more avocado to prevent that. My wife and I found this very refreshing and flavorful. I made a couple modifications, no avocado so added 1 teaspoon coconut oil. Used almond milk. Added couple sprigs of cilantro and 1 teaspoon ginger juice and 2 tablespoons flax seed and 1/2 banana. Only thing, I have trouble peeling a kiwi. Maybe just me or the kiwi was very soft. Thank you Ryan. Nice to hear you and your wife found this refreshing and flavorful, Ron. Love the modifications you made. It is tough to peel a kiwi. I actually rarely peel them because of that and there’s no harm in eating the skin. I didn’t have most of the ingredients listed. So I used 2 fresh kiwi, a can of pineapple slices (juice and all) & some almond milk (vanilla).